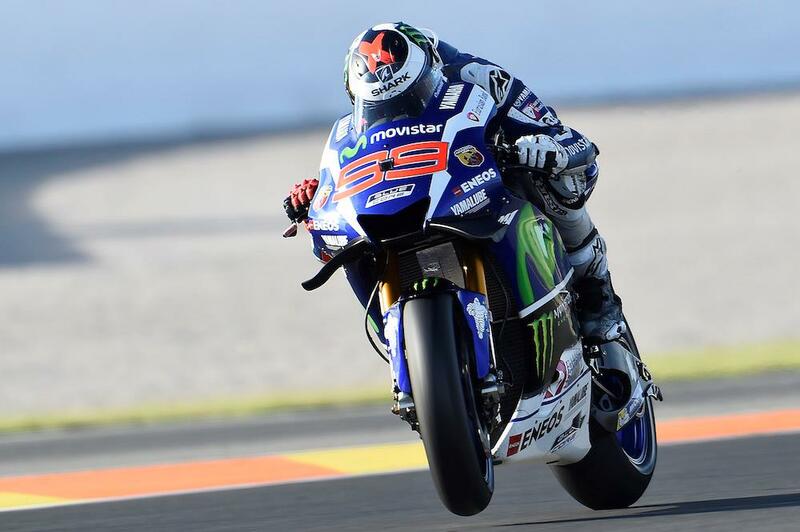 Jorge Lorenzo enjoyed the perfect end to his Yamaha career with a stunning lights to flag victory in the final race at Valencia. Having obliterated the outright lap record to take pole on Saturday, Lorenzo vaulted off the line to lead at turn one and didn’t look back, pulling out a second’s gap over his rivals in the opening two laps. Smashing the circuit lap record on the second lap, Lorenzo soon checked out as a gigantic battle ensued behind for the runner-up spot, with Iannone, Rossi and Marquez all in contention. Having opted for Michelin’s harder front tyre and suffered a bad start, Marquez had his work cut out in the opening part of the race before finding himself in the battle for second. Once he was through, his pace was enough to begin closing in Lorenzo’s lead in spectacular fashion but it wasn’t quite enough, reducing a five second gap to just one as they crossed the line on the final lap. Iannone took third after a moment between him and close friend Rossi on the penultimate lap saw the Yamaha rider run off the track. Maverick Vinales bid farewell to Suzuki with a fifth place, while Pol Espargaro pipped Andrea Dovizisoso to the line for sixth but it wasn't enough to pinch the Independent Riders’ Crown from Britain’s Cal Crutchlow who crashed out of contention mid-way through the race. KTM’s MotoGP debut didn’t go as planned as Mika Kallio retired into the pits with just a handful of laps to go.